Mayo Clinic's three transformational centers - the Robert D. and Patricia E. Kern Center for the Science of Health Care Delivery, the Center for Regenerative Medicine, and the Center for Individualized Medicine collaborate with the Madonna Living Community to offer a bi-monthly speaker series in which Mayo Clinic speakers share their research on topics relevant to both residents and the surrounding community. On Thursday, December 17, Dr. Ramona DeJesus spoke about Depression Management in Primary Care: The Collaborative Care Model to an audience at Madonna's Sister Generose Auditorium. She described a collaborative care model program, called Depression Improvement across Minnesota, Offering a New Direction. DIAMOND was launched in 2008, in collaboration with the Institute for Clinical Systems Improvement (ICSI). This program brings together teams consisting of their physician, a care manager, and consulting psychiatrist, to provide evidence-based collaborative care to patients with depression in a primary care setting. Still underdiagnosed and undertreated, depression is the second most common mental health illness worldwide. It is a dangerous diagnosis — putting patients with depression at a higher risk for heart disease, hypertension or stroke. Because many patients presenting with depression are often first seen and treated in primary care rather than psychiatry, DIAMOND was designed with that in mind. The primary care doctor uses a standardized screening tool called the PHQ-9 and uses the resulting score to diagnose depression. From there, they then initiate treatment for their patient and refer them to a care manager. The care manager enrolls the patient into DIAMOND, and works closely with the patient to track their progress. The care manager consults regularly with a psychiatrist, who makes recommendations to the care plan in place. As patient PHQ-9 scores improve, they graduate from the program. Since 2008, over 6,000 patients have been enrolled in DIAMOND at Mayo Clinic. Results from the program indicate demonstrated improvement in remission rates, productivity, and patient satisfaction, published in Postgraduate Medicine. The DIAMOND model has been expanded and adapted for adolescents — the expansion program is called Early Management and Evidence-Based Recognition of Adolescents Living with Depression (EMERALD). The next presentation in the Madonna Living Community's speaker series will feature Dr. Eric Wieben from Biochemistry and the Center for Individualized Medicine speaking on the topic of Clinomics. The public is welcome to attend this event, which will take place February 18, 3 p.m., Madonna Towers, 4001 19th Avenue NW, Rochester, Minnesota 55901. Free parking is available in the Pax Christi parking lot along 41st Street NW. 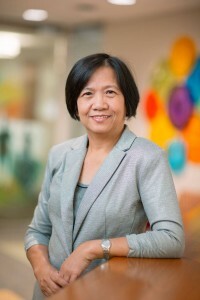 Ramona DeJesus, M.D., is a Primary Care Internal Medicine physician, an Assistant Professor of Medicine in the Mayo Clinic College of Medicine, and a Population Health Science Scholar in the Mayo Clinic Robert D. and Patricia E. Kern Center for the Science of Health Care Delivery. Her research interests include diabetes, pre-diabetes, mental health, obesity and wellness coaching.